In March 2018, Columbia University’s Italian Academy sponsored a symposium titled Threatened Heritage: Bears Ears, Chaco and Beyond, which explored the implications – social, archaeological, environmental, spiritual, historical, artistic and legal – of the current threats to Bears Ears National Monument and Chaco Canyon. Elsa Stamatopoulou, Director, Indigenous Peoples’ Rights Program at the Institute for the Study of Human Rights, spoke on cultural heritage as a human right, the historical context of the international Indigenous peoples’ movement, the role of the United Nations in Indigenous peoples’ rights, and the contemporary threat of extractive industries to Indigenous peoples’ rights and land around the world. 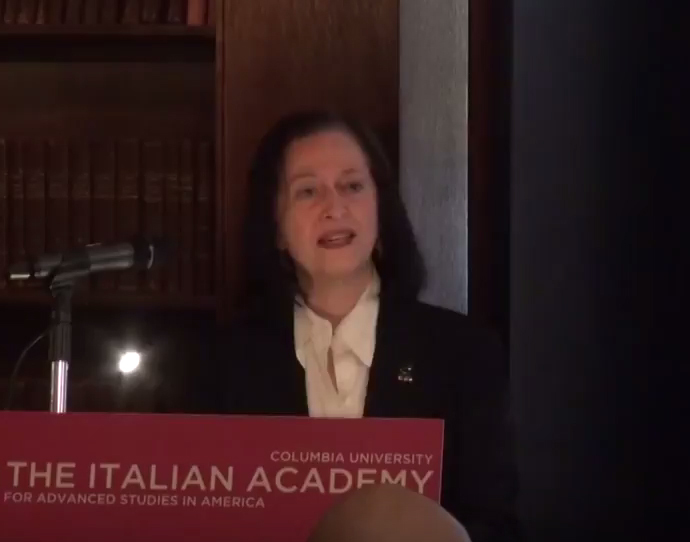 Stamatopoulou joined Columbia University in 2011 after a 31-year service at the United Nations with some 22 years dedicated to human rights and eight years exclusively devoted to Indigenous Peoples’ rights. Indigenous issues were part of her portfolio since 1983 and she became the first Chief of the Secretariat of the United Nations Permanent Forum on Indigenous Issues in 2003. Hear her comments below. For the full recording, click here for Part 1 and here for Part 2.